Next weekend in the UK is Tewkesbury Festival and the weekend after is Festival of History and I will take along my Albion collection for a handling session at 6pm on the Saturday evenings. If you are interested please come along to the Tods Stuff stall - I provide the swords, you provide the beer. I provide the swords, you provide the beer. I wish I could be there but there is an ocean and a continent between me and Tewkesbury. Please tell us which Albions will be there, so I can daydream about it. The session will run from 6pm at my stall and if you are not taking part and cannot make this time, come in the day and I will show you at 1pm. 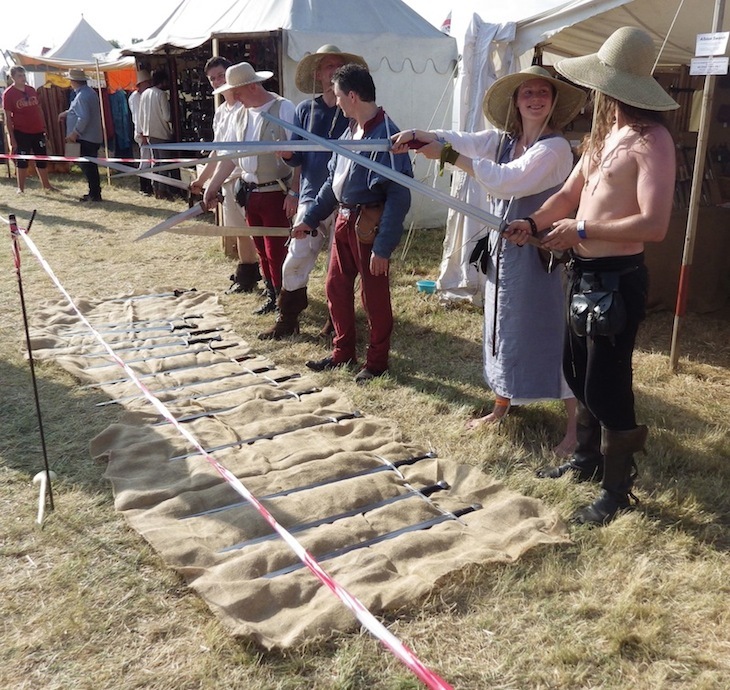 It was a sweltering hot day and many people stayed flat on their back s in the shade after the battle but those that did come got to handle 21 assorted swords. A nice, seriously nice grouping of Albions. Do you have additional pictures of the handling session? Did you end up with any fingerprints on the blades? With this crowd, surely not.